By LUDWIG VON KOOPA - Super Mario Run was custom-made to troll my sensibilities. I know I should feel disgusted and sick from hearing about this, but honestly, I feel pretty numb. This is the sort of thing I've come to expect. Let's... try to explain that. Basically, Nintendo (Shigeru Miyamoto) was at the big Apple event and announced this thing, Super Mario Run, coming to Apple devices this December. No word on anything regarding Google, and those Fire Emblem and Animal Crossing mobile things are delayed, not that we knew anything about them. Basically, this is an auto-runner with New Super Mario Bros. graphics and New Super Mario Bros. music... with the exception of BAHs. So I suppose that's a remarkable improvement over the original. Basically, the tap is context-and-timing sensitive. The plumber is a lot more acrobatic than normal. Here he's doing a roll for some reason. So... it's an auto-running thing in the New Super Mario Bros. mold that requires just one button. It's designed by Shigeru Miyamoto, and is exclusive to Apple systems. ...Announced at an Apple conference that also announced a really terrible product in the iPhone 7. All of those are pretty bad things. 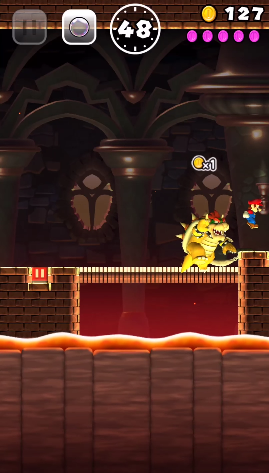 Plus, they treat King Bowser Koopa as a stationary obstacle. Even worse, he clips solid structures. 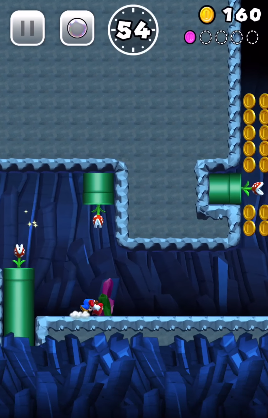 You can “create your own Mushroom Kingdom using the coins and Toads collected by playing”, which presumably means a level editor that will be significantly worse than Super Mario Maker, and worse than Super Mario Maker for 3DS. Of course, since you need to collect things for that, you can be assured that this course-creation will also be behind the pay gate. At least that means not many people will actually get past that gate and upload their terrible creations. ...Oh, that was a presumption on my part. No word on the sharing of “your own Mushroom Kingdom”, but I wouldn't be surprised if they showed more love for Apple iOS garbage than their own 3DS. Ludwig still does not have a smartphone, and if he did, it wouldn't be an Apple one. He wouldn't even try this crap, and neither should you. He hopes that he doesn't show up as a boss/stationary obstacle. The new people playing Nintendo's mobile offerings don't even stick around. This seems like the type of game that tries to get former gamers, whom are now mobile fools, like Ted Cruz, back to Nintendo. Doubt it'll work. Shigeru Miyamoto actually pulled a PR stunt where he eats a hamburger while playing Super Mario Run. Ludwig clarifies and corrects some of the presumptuous statements he made in this article about Super Mario Run and its pay gate. Unless this means they stop making real Mario games, I don't see how this hurts anything. "will be able to enjoy all of the game content available in this release after paying a set purchase price"
"all of the game content"
Unless they're being deliberately misleading, this means it's a free demo and then you have to buy the full game. Not microtransactions. Well, over in traditional game purchases land, they TELL you it's a demo up-front. Here, this “demo” IS what's marketed as the game. It's a different dynamic here. If Miyamoto won't go full-time into movie-making, maybe he'll go full-time into mobile garbage. There, story and characters aren't a big deal! It's perfect. Yes, but it's not the sort of pay gate people get upset about. Hahaha, maybe he will. Although mobile games with stories do exist, they're just not as common. Unless they dunno the pay gate was gonna exist. You know he'd lunge at the opportunity. Okay, some might get upset, but most people aren't bothered by games that are a one-time purchase. Many would prefer it to the F2P model. Well, for this particular one, you'll probably get all of what the game has to offer from playing it once! Lucky for you, I happen to have meat aversions now during pregnancy so it is hard for me to finish a burger at all at this time. I don't think that benefits me in any way. When I heard that Nintendo appeared at the Apple conference, this is what first came to mind. "We at Nintendo are all about innovation. This is why we have partnered with Apple, a leader of Chinese innovation, to bring you one of the newest and greatest pieces of technology to ever hit the market. Introducing the Nintendo NX - a smartphone that is capable of playing all of our newest games in 4K resolution. Say goodbye to physical buttons, because those are a thing of the past! With the Nintendo NX, the touchscreen is your controller. Besides having a stellar library of games pre-installed, such as Super Mario Run, Miitomo, Pokémon Go, and the never before seen New Nintendo Badge Arcade, the NX will also be NFC compatible, which means you can expect amiibo to be used in creative new ways. We are excited to announce that the first wave of Nintendo NX devices will also be bundled with an Arcade Bunny amiibo. Just tap this amiibo on your screen and every microtransaction will automatically be reduced by 5%! Please stay tuned for further information to follow in the upcoming months." ...You're not far off. Rawk is now convinced that the NX is a Nintendo-Apple collaboration.